Here at Derring-Do Medals you can﻿ find out more about us﻿, take a look at the gallery and discover where you can buy our medals. We daresay you probably are. Looking for a unique gift for a loved one? We can probably help. Our medals remain sought after by discerning and unconventional individuals from all segments of the globe. You'll currently find a selection of medals for sale in our Derring-Do cases in Edinburgh at Embo, Leith Walk's most flavoursome cafe/deli at 29 Haddington Place. 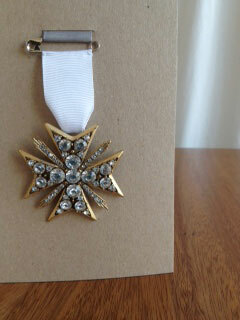 Why not enjoy a coffee while you consider who amongst your family, acquaintances and friends most deserves a medal. Perhaps it's you? Find us on Facebook for up to date news and events. And if you like us why not like us? We'd like you to like us if you like us. And if you are the recipient of a medal and live somewhere a long way away we'd love to hear where you are and we'll update our map. All images and text © 2012-2018 N. Murray at Derring-Do Medals unless otherwise indicated. All rights reserved.